Roast Vegetable Soup (Whole 30) | Healthy. Delicious. 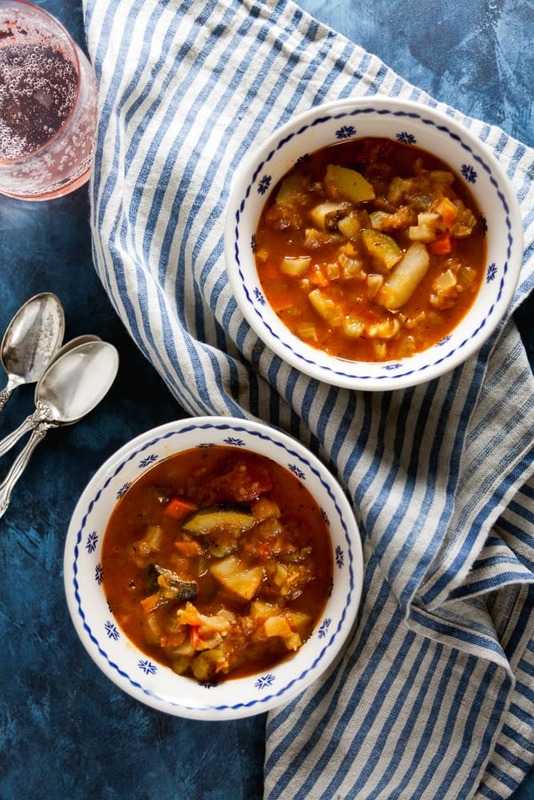 Hearty roast vegetable soup is a go-to for the cold winter months. Make a big pot and eat it all week long! Over the past few months I’ve fallen into some really bad eating habits. Lots of take out, lots of carbs, LOTS of chocolate, and not nearly enough vegetables. So, earlier this fall, I did a round of Whole 30 to get my eating back on track. It only took a few days of hearty kale salads and pan-roast pork chops with grapes before I felt like my old self again. This roast vegetable soup was my secret weapon to getting though the more difficult days. It was great for lunch, as an extra serving of vegetables with my dinner, or even as a filling snack. This soup was inspired by minestrone, but since pasta and potatoes aren’t allowed on Whole 30 I swapped them out in favor of potatoes. It was a delicious alternative, although a can of white beans would still feel right at home in this soup pot. 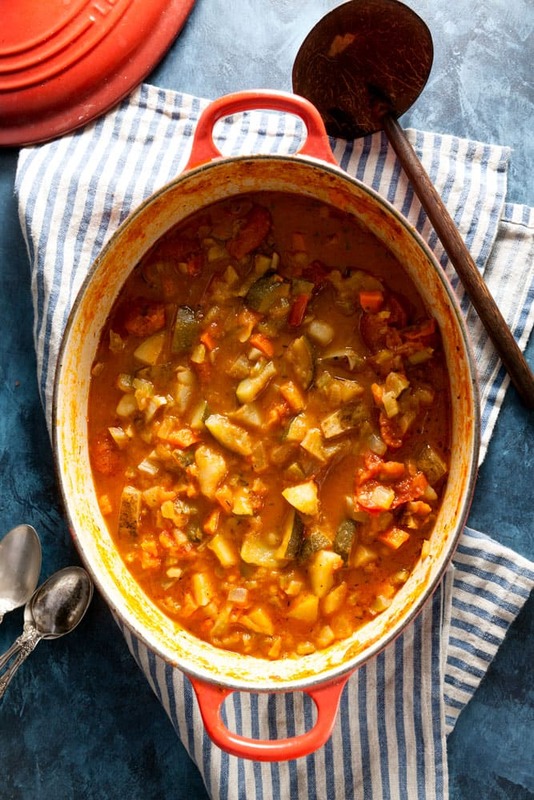 One of the things that I love most about roast vegetable soup like this one, is that you can basically use whatever vegetables you have lurking in the depths of your refrigerator. No fennel? Swap in cabbage. Don’t like carrots? Leave them out. Leftover greens from that kale salad I mentioned earlier? Go ahead and throw it into the pot. Really, pretty much anything goes. 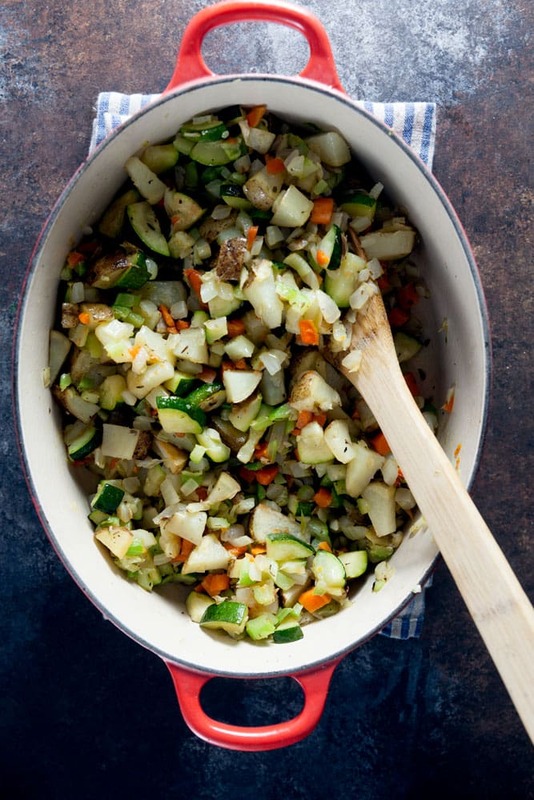 For this soup, I also tossed the potatoes, fennel, carrots, and zucchini in a little bit of olive oil, then roasted them in a hot oven just until they started to caramelize around the edges. This helps concentrate their flavor and give each bowl an extra layer of complexity. I also added a can of fire roasted tomatoes to the pot to add even more smokey, roasted flavor to the recipe. This roast vegetable soup recipe originally appeared on Food Fanatic, where I contribute original soup recipes. This soup is delicious! I will be making this again and again! I think next time I may add in some chopped spinach at the very end. I seriously love this! I completely agree with you about getting off track really quickly (especially during the holidays), and what a bonus to have leftovers for a delicious, healthy, and easy lunch! Wow this looks perfect for the deep freeze we have going on in Minneapolis right now! Love soups like this! I liked adding beans (I realize that’s not #whole30 appropriate) and sometimes have a bowl for breakfast!